Discussion in 'Universal Orlando Resorts & Hotels' started by schumigirl, Oct 14, 2016. Hi. Quick question. We usually stay at HRH, but they are booked the weekend we are planning to visit. We love their poolside bar and service that is offered when just hanging out for the day. Is there something similar to that at this hotel? Thank you. It isn’t next to the pool, but Strong Water Tavern has good service, food, and a large selection of drinks. It a nice place to hang out for the day when the weather is nice. jerseygal and pattyw like this. I second Strong Water Tavern! They have lovely outdoor seating as well as ample indoor seating! Nice menu and great drink and rum choices! saskdw, jerseygal and patster734 like this. We loved the poolside service we got from Drhum Club by the pool...…..it was excellent and cocktails are very good!!! They also have a firepit at night which is adjacent to the pool too...….very nice to sit around with drinks and food. And yes, StrongWater is excellent...…..we love our many visits there...…. jerseygal and patster734 like this. I know there is a celebration cake option at Royal Pacific, but has anyone ordered a celebration cake/cookies/etc from Sapphire Falls? I couldn't find anything on the sticky or the official website about these options. Thanks! Sign now on front desk for customer information. It does say Royal Pacific, but Sapphire has the same sign up too. Guess this is now becoming the norm ,since Las Vegas just like it is at Disney. Anyone have an email for room requests? Have a king suite booked and a standard room as well and would like to request they be connected. I did request them when I booked but I don't see that request anywhere on my confirmation. It is just the standard form letter emailed to me listing dates and costs per nights. But when I call the hotel, they have it noted in their system. 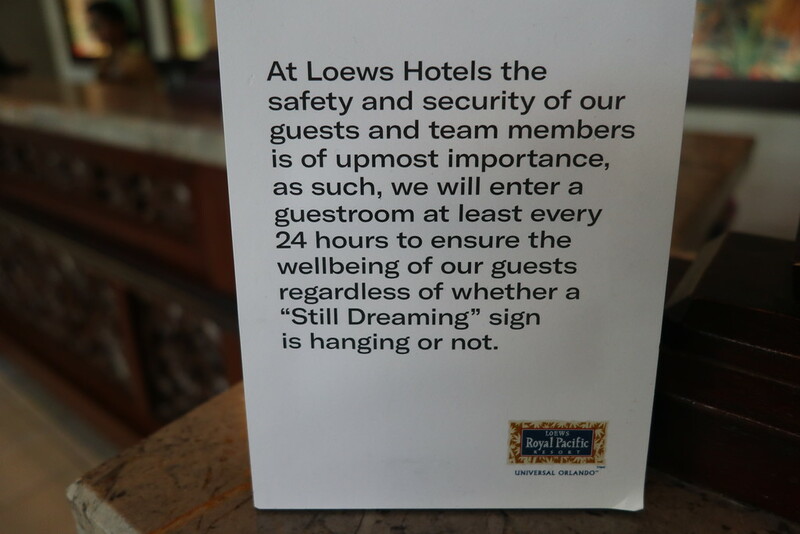 Would assume that Sfalls operates the same as the other Loews hotels. I was thinking that too but my Portofino Bay confirmation has my request for adjoining rooms on it. I made a reservation for connecting rooms for our recent visit. The online reservation did not note the request, but when we checked in, they were indeed connecting rooms. This was our first stay at SF (and our first stay at a non-premiere USO resort). It was really nice! The beds were comfortable, nice showers, great pool, and the layout of the hotel was nice. The water taxis are closer to the hotel than PB, HRH, and RP. The only downside was not having express passes. That really is a big perk. In the future, when we only need one room, we will get a premiere room. If we need two rooms, I will probably book SF again, but I will most likely get a redundant room at RP for a night just to get two days of express pass. Without express, you really need to utilize the early admission and lower waits in the morning. However, when you're going to HHN, it's really hard on the body to burn the candle at both ends. It's great to have the option based on the needs of the specific trip, though! jerseygal and imprint like this. We did get a connecting room to our King suite as we requested. We really enjoyed the room! I’m staying at Royal Pacific now. Thinking about checking out the pool at Sapphire Falls this evening and then have dinner and drinks at Strong Water Tavern. Does anyone know if there’s a shower room at Sapphire Falls I can use after the pool so I don’t have to get back to my room at RPR? Thanks!! Would love to hear feedback on Strong Water Tavern, thinking of eating there after check in first night. ThAmos! We think it is our favourite bar in Orlando. Food is excellent and cocktails are strong if you enjoy an alcoholic beverage......they are fresh and unique. Chef Carlos creates the menu personally, all from him. Portions are excellent and tapas style, so you can try various dishes and not be too full, although the portions are good. We have tried every dish except the vegetarian ones, and they are all lovely...….the ceviche options are second to none. There are pictures in the food thread in the stickies. It is a beautiful bar and staff are stellar. Very welcoming and it has a warm atmosphere. The views over the lagoon where the boats come in is beautiful. You can see Hulk and Doom all lit up at night. Can`t say a bad word against it...…..it`s perfect!!!! patster734 and jerseygal like this. Thanks Schumigirl! Sounds like a plan, yummy! We're staying at Sapphire Falls for the first time this winter. RPR was way too expensive that week, we're not going to focus on rides, and it will be nice to try somewhere new that has the same level of service. One thing we love about RPR is how accommodating they are with to-go meals -- kids' chicken sandwiches from the pool bar and grill, and even pizza from Jake's. Will we have the same experience at SF? Also, are there any reports about this new room-checking rule? Can I schedule the check with the concierge? My teenager will be in the room alone for a good portion of the day on at least two days and would be very anxious anticipating random checks. BTW -- Thanks so much for all the info in these stickies. It made our last trip that much better and I'm sure will again. VERY EXCITED about our upcoming trip! Have read consistently great reviews on Sapphhire Falls! Seems like customer service and the pool is the strongpoint of this hotel!